Another thought provoking session on Quality Journey – 5S to Six Sigma was organised on 19th August 2017. 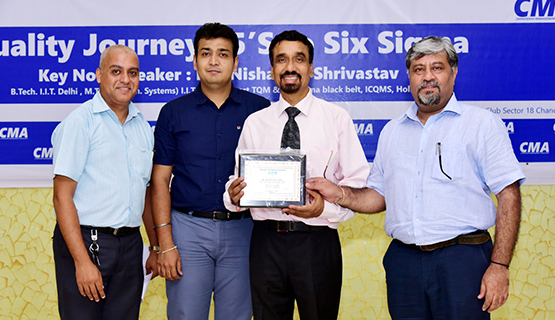 Mr. Nishant K Shrivastav – the black belt trainer in six sigma was the key note speaker. About 50 CMA members and professionals from industry, government, academia and students took part in this session. Mr. Shrivastav very well connected with the audience and the session gained its momentum effortlessly as he began with basics and took it to professional level. Illustrative presentation and simple but unique style of the speaker made the audience understand this intricate concept well. Mr. Hitesh Kumar Gulati, Secretary General designed and presented the analysis of the online anonymous survey with Mr. Shrivastav’s suitable explanations.